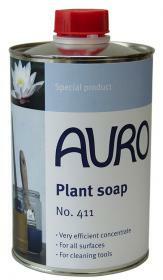 Specially designed for washing paint brushes and rollers after applying AURO Aqua products. Universal cleaning agent for light to moderate soiled surfaces, for all surfaces, slightly caring. Suitable for ceramics, stone, unglazed tiles, plastics, stainless steel. Do not use on coated surfaces. Can also be used for cleaning utensils (brushes, rollers, etc.). Natural products are not odourless or free of emissions. Natural products are not odour- nor emission-free. Dissolve the plant soap concentrate in warm water, or use undiluted. Dilution depends on application: - For wiping down surfaces: 10 - 20 ml of soap for 10 l water (maximum 0.2 %). For cleaning of tools: brush or roll paint out. If necessary, depending on soiling degree, let undiluted plant soap act on for a certain time, then rinse thoroughly with water. For stubborn soiling: use undiluted. Carry out preliminary trials to avoid damage of the surface. Packaging material Tinplate. Pouring spout made of polyethylene. Attention Shake before use. Avoid contact with eyes. Use only original container. Store cool, frost-free, tightly closed, out of reach of children. UBA- No. 20410001. Hazard Class Does not apply. Storage stability Approx. 24 months.